This tapestry is based on a work designed by William Morris in its entirety, which is very unusual in the works of Morris and Co, this tapestry "William Morris Woodpecker II" shows a reproduction of the masterful design of Morris from 1877. In this version of this piece, we see the acanthus leaves in a cyan green blue. The woodpecker is perched on the tree laden with fruit and a poem accompanying this scene describing the legend of the Italian king who was transformed into a woodpecker. The words of the poem reads "I once a king and chief, now am the tree-barks thief, ever twixt trunk and leaf, chasing the prey". 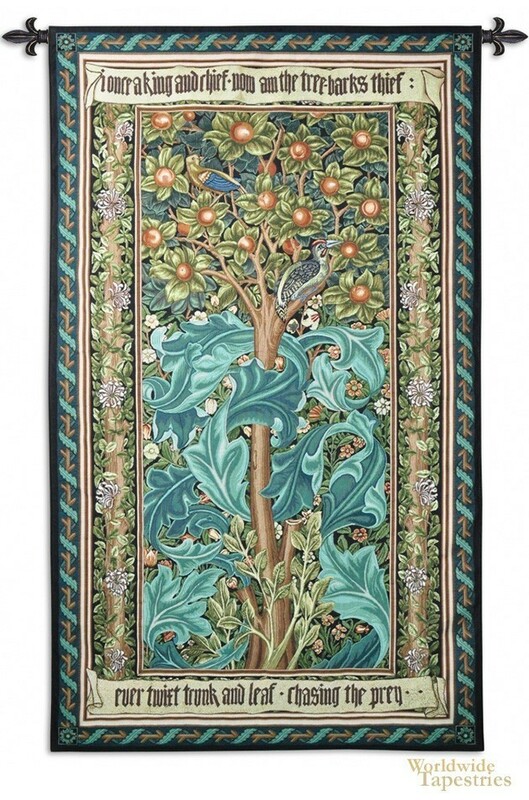 Gorgeous in design including the detailed acanthus leaves and the leaves and fruits of the tree and elaborate border, this piece is a well loved work of Morris. This tapestry "William Morris Woodpecker II" is backed with a tunnel for easy hanging. Note: tapestry rod and tassels, where pictured, are purchased separately. Dimensions: W 41" x H 68"